With Christmas just around the corner I know most of you are already on the hunt for the best Christmas gifts for toddlers and I am here to help. I recently discovered a lovely online toy store Wiggles Piggles. They stock the most beautiful baby, toddler and children’s toys and accessories and they have quickly become one of my favourite online toddler stores. You can see their full range at www.wigglespigglesonline.com.au or on Instagram. 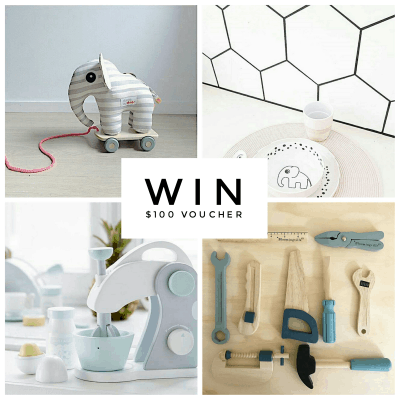 I am very excited to announce that the lovely team at Wiggles Piggles have agreed to provide one lucky reader with a $100 gift voucher to spend in their store (Aus only). With so many items to choose from, the challenge will be narrowing down what you are going to spend it on. Follow My Bored Toddler and Wiggles Piggles on Instagram and then tell me which item you would LOVE to buy if you won the gift voucher. You can leave your comment below. Would love the mini tool set for my girls! They love ‘fixing’ stuff with Daddy! Love the custom made Christmas baubles. It’s just around the corner and would be a special ornament my kids would love to put on the tree. Miss 5 would love the doctors set. She’s always looking after her ‘babies’ and putting bandaids on them, getting them to rest until they feel better. Very much the ‘carer’. I absolutely adore the black and white Sketch Inc nesting dolls – I’ve had my eye on these for quite a while. Thanks! 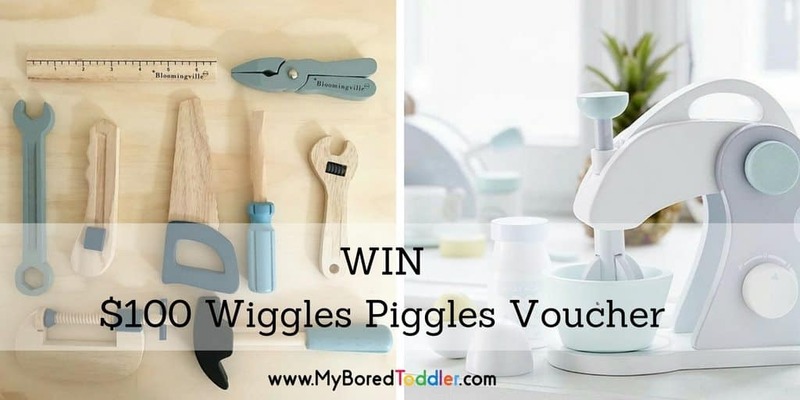 Oh my heart there are so many lovely products at Wiggles Piggles and with Christmas coming up this would be such an exciting giveaway to win! I would love to get the coffee machine because Miss 3 has gotten into the morning routine of helping me make my coffee – she drags a chair over the the kitchen bench, chooses my mug, chooses the pod, puts it in and turns it on! She would love to add a coffee machine to her play kitchen ? I would love to get the Doctors set and the Dear Little letterbox so I can leave sweet little notes for my girls to read each day. I’d have to buy the ‘Grimms Stacking Rainbow – Medium’, I’ve always wanted one (I’m a sucker for rainbows!) and I reckon my kids would enjoy playing with it too! I am loving the elephant on the skateboard, the “Done by Deer Pull Along Elphee”, it’s the cutest thing I have EVER seen. I would buy a million of them if I could. Grimms monochrome stacking bowls would be great for an amazing amount of activities. Stacking, coloring sorting and guessing games.Would be an awesome item to own. The LE TOY VAN Chococcino Machine and Cake stand set would go perfectly with the play kitchen I’m buying my twin girls for Christmas. I’m so in love with the Kids Concept coffee machine. So stylish I won’t need to pack it away. I’m so chuffed wigglespiggles are stocking this range in Australia. Would love to pickup one of your Kinderfeets Balance Bike’s, I think if my boy got his hands on one these i wouldn’t be able too get him off. What a great comp! My two kids love to make me ‘special treats’ in the wooden toy kitchen, so I can’t take my eyes off that mixer. Too gorgeous! The Doctors Set… Just what the Doctor ordered for the kids to play and have fun with! Id love to get the Filibabba Babynest Aztec Dusty Rose babynest for a new arrival due next year! They’re so gorgeous. The mini tool set as Dad is very handy so he’ll love to play along with him on the weekends. My daughter would like the pink shape sorter truck. The Mini Tool set would make my little man so happy! He is always trying to help me fix things 🙂 Good luck all..
My little one would LOVE the Wooden Passenger Train as he is obsessed with trains! Children grow so quickly, so I would live the ‘Birds Height Chart’ This way we could measure the treasures every month. Grimm’s Stacking Rainbow Medium. So many uses for imaginative play, it’s fantastic!